Last week, Facebook announced that March 12th would mark the beginning of a major upcoming purge of likes from “deactivated and memorialized accounts.” Over the next several weeks, likes and comments from inactive accounts on business pages and posts will slowly begin to disappear. What does this mean? Well, if you have a business Facebook page you’ll almost certainly see a slight drop in your fans count. Aside from that? There’s really very few negative effects you can expect from this upcoming purge of inactive likes. Facebook isn’t going to remove fans from pages they aren’t actively engaged with. They’re simply severing the connection between abandoned Facebook profiles and business pages. The drop in fans count could be slightly worse if you’ve had a history of purchasing likes, since many of these originate from profiles that never saw much active use. However, the majority of SMB inbound marketers shouldn’t be too concerned about this announcement, and here’s why. Facebook isn’t a simple social media network. If you think Google search’s algorithm is complex, you should see the laundry list of factors that affect who sees what in their news feed. Affinity toward content and brand can affect the amount of views a post gets, as well as perceived accuracy and quality of the content in the post. As of November 2014, Facebook has openly admitted that they have begun penalizing overly promotional posts, which means sales-focused, reused or context-less advertisements. And we haven’t even started to touch on Facebook’s user experience research! Many of the changes to the Facebook algorithm over the last year have resulted in exactly what the massive brains behind the world’s biggest social media network intended from the start; higher quality content, and less news feed space dedicated to low-quality posts from brands that aren’t using Facebook correctly. However, it also means that many social media managers at small or mid-sized brands who are doing everything correctly are struggling to get their posts seen; which has lead to an increase in paid social advertising and more focus on alternative platforms. The point? Social media simply isn’t stagnant. It’s a highly dynamic medium. While Facebook’s announcement that they’d be deleting likes has gotten tons of attention, its affect on small and mid-sized business owners is likely to be minimal. Abandoned or memorialized Facebook profiles won’t comment on your posts or share your content with their friends, and they won’t be purchasing your product. How Much Do Facebook Likes Matter? The truth is, Facebook likes are completely a vanity metric. Unlike other social media metrics, likes don’t measure engagement. They aren’t directly correlated with your customer’s sentiment about your services, or a measure of how effective your content marketing efforts are. There is certainly some weight behind likes, and the difference between 90 and 2,000 fans can carry a lot of weight for a small organization or brick-and-mortar store. However, we maintain that Facebook likes are nothing more than likes; a limited measure of fandom. No Really, What Should I Expect From This Purge? Absolutely nothing. You’ve got absolutely nothing to worry about. As Business News Daily highlights, the effects of this purge will be increased accuracy in data reporting. 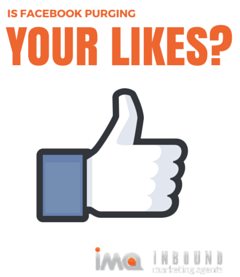 Social media managers will have a better idea who’s liking and interacting with their pages. Facebook has directly stated that if a fan signs back into a previously deactivated account, their fanship to a business page will be reinstated. Even if your fan count does drop a bit further than you’d hoped, the effects won’t be severe. Your reach and engagement, which are two of the factors Facebook leans on most heavily to determine how far your content travels, will remain the same. While the social media network’s recent announcement made a serious splash, it’s really no major revolution in the world of social media marketing. Have you begun to see any changes in your company’s Facebook page since the purge began on Thursday, March 12th? Share your thoughts and experiences in the comments!